Maahi Roj means Earth Day Every day, hosted by AnanTaya, is an ongoing experience of unearthing the Planet’s Potential for sustainability in collaboration with like-minded thinkers. With our eco-conscious, small footprint, users of natural, organic and recycled materials we produce a 10-day showcase of heritage and innovative crafts representing ethical fashion and lifestyle products, under the concurrent themes of the Planet’s Potential, Wishes for our Wonderful World, and ‘emotionally durable’ crafts and design. We welcome ‘children of all ages’ and curious seekers to enjoy the opportunity to shop ethical, earth-conscious products, clothing and food. We invite you to meet diverse, emerging, as well as, experienced talents through events including Interactive Workshops, Heritage Walks, Inspiring Talks and Cultural Tours (including artisans at work), all to bring a greater understanding of how we can pay tribute to Planet Earth. 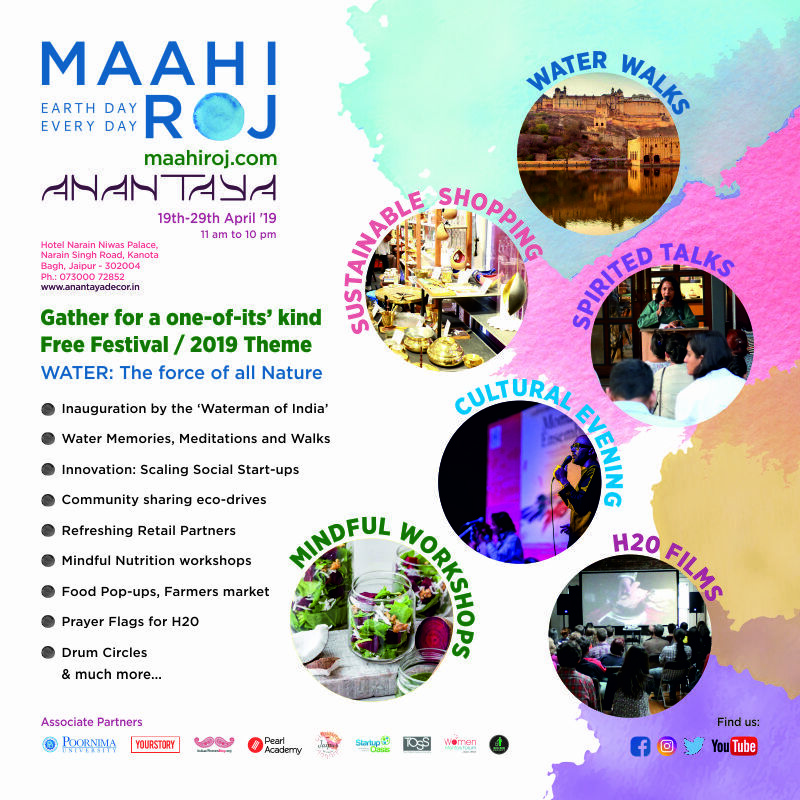 “WATER” as the theme for Maahi Roj: Earth Day Every Day, the ten-day festival, April 19 – 29 at AnanTaya, The Kanota Courtyard, Narain Niwas Palace Hotel, Jaipur.